Stocks gained on Thursday with the tech-heavy Nasdaq pacing gains while the Dow and S&P 500 again made record highs after a rash of economic data this morning. The big market news, however, came late in the day as Janus Capital announced that George Soros would give Bill Gross $US500 million to manage as part of a separate account to be run like the Unconstrained Bond Fund Gross runs at Janus. 1. The biggest economic story on Thursday was the Philadelphia Federal Reserve’s latest manufacturing report, which came in at its highest level since 1993. The report’s headline index rose to 40.8 in November from from 20.7 in October, an increase that also blew away expectations for the reading to fall modestly to 18.5. Following the report, however, some economist expressed scepticism, with Paul Dales at Capital Economics saying that this report was “hard to take seriously,” particularly in light of other economic indicators, weakening global demand and a strong US dollar. 2. 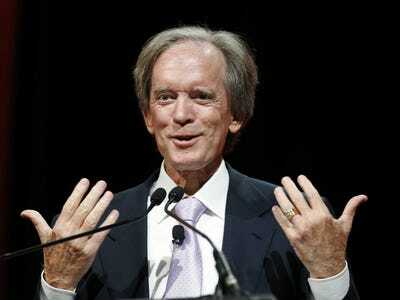 In the markets, the biggest story on Thursday was news that a fund affiliated with George Soros’ Soros Management would invest $US500 million with Bill Gross in a separate fund to be run with a strategy similar to the Unconstrained Fund that Gross currently runs at Janus Capital. Following the news, Gross said on Twitter that he was “honored” to be managing the new account for Soros. Janus shares gained more than 1.5% on Thursday following the news. 3. Aside from the Philly Fed report, we also got manufacturing data in the form of Markit’s flash PMI reading, which showed manufacturing activity in the US slowed to a 10-month in November. The headline index came in at 54.7, missing expectations for a reading of 56.3 and lower than October’s 55.9. This disappointing report is part of what economists pointed to when arguing that the Philly Fed numbers didn’t square with other economic indicators. 4. On the housing front, the pace of existing home sales accelerated more than expected in October, climbing 1.5% to an annualized pace of 5.26 million, beating expectations for this reading to show sales coming in at a pace of 5.15 million annually. 5. Inflation was flat in October, according to the latest consumer price index from the BLS. Expectations were for the headline index to show prices fell 0.1% in October. Excluding food and energy, prices rose 0.2%, which was also more than expected. Following the report, Ian Shepherdson at Pantheon Macro said the report shows that deflation fears gripping Europe continue to not apply in the US. Gas prices, which weighed on Thursday’s report slightly less than Shepherdson expected, are likely to drop sharply again next month. 6. The latest report on weekly initial jobless claims showed claims remain near multi-year lows, though Thursday’s report slightly missed expectations. Claims totaled 291,000 last week, down from last week’s 293,000, but slightly better than the 284,000 expected by economists. 7. Goldman Sachs was out with a couple of forecasts for 2015, and among them were the firm’s price target on the S&P 500, which came in at 2,100. Goldman expects just a 5% gain for the benchmark stock index next year, in-line with earnings growth and the firm doesn’t see any multiple expansion next year. Goldman does, however, expect the stock market to take the Fed’s first rate hike — which the firm sees occurring in the third quarter of next year — in stride. In a separate note to clients, Goldman Sachs issued its 8 favourite trades for 2015. Business Insider’s Sam Ro has the full rundown: some of these are pretty complex. 8. The biggest market story of 2014 has been the decline in the price of oil. In an email earlier Thursday morning, Deutsche Bank economist Torsten Slok circulated a chart that shows the huge increase in US crude oil production over the last few years. This increase in global supply, Slok wrote, tells the whole story for oil. 9. Apple shares continued to grind higher as yet another slew of Wall Street analysts raised their price target on the stock. Thursday’s notable increase came from Gene Munster at Piper Jaffray, who took his price target on shares of the iPhone marker to $US135 from $US120 citing stronger than anticipated iPhone sales. 10. Two of the big stock losers on Thursday were closely watched companies Keurig Green Mountain and GoPro. Keurig, which makes single-serve coffee cups and brewers, declined more than 7.5% after the company on Wednesday night reported earnings and gave an outlook for its upcoming quarter that disappointed. GoPro shares fell more than 8% after the company’s secondary offering of common stock was priced early Thursday at $US75 per share.